Apple’s integrated hardware and software system make it the most valuable PC maker in the world, according to a research note from Deutsche Bank. While Apple has just 7% of the share of revenue, it’s grabbing 35% of the operating profit. Deutsche Bank attributes it to the strength of the Mac/MacBook lineup. 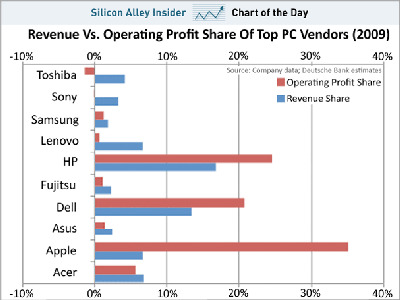 Other companies are losing profit margins because they have to pay Microsoft for software.